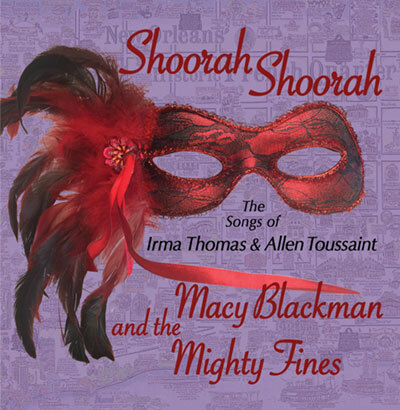 The Mighty Fines and I have been in the studio recording our new CD, titled "Shoorah Shoorah - The Songs of Irma Thomas and Allen Toussaint." It's a tribute to the music and genius of the Soul Queen and King of New Orleans and by far our best effort yet. Every number has a great texture, and they're all different. I sing six of Allen's tunes, Brickyard Blues, Workin' In the Coal Mine, Lipstick Traces, Holy Cow and With You In Mind. Oh, and Shoorah Shoorah. Nancy Wright is featured on seven of Irma's - Ruler of my Heart, I Done Got Over It, You Ain't Hittin' on Nuthin', Take a Look, Look Up, It's Rainin', and In Between Tears. And that's the long tall and short of it. We had a rocking great CD Release Concert at The Back Room in Berkeley on March 19. For those that missed the event, the album, Shoorah Shoorah, is available now to download from CD Baby. As an appetizer, here are two tasty samples.